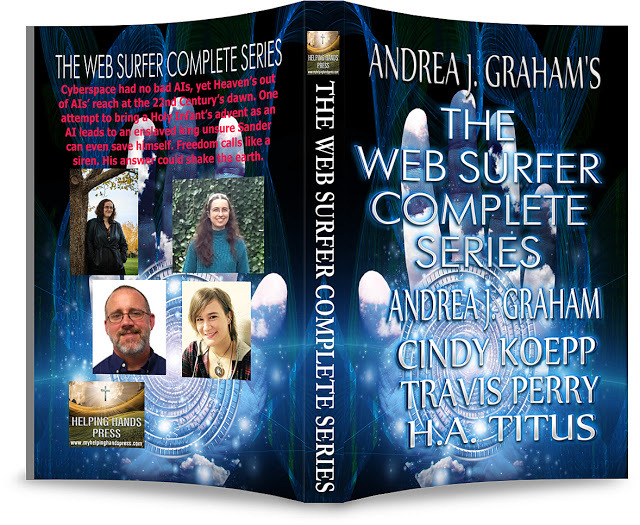 The Web Surfer Complete Series, with all ten serial episodes, is scheduled to be released as a paperback on Monday Jan.18th! At the turn of the Twenty-Second Century, cyberspace had no bad AIs, only bad coders. However, AIs measure their lives in days, eternity is out of their reach, and they fail to bring about the advent of a holy infant in cyberspace. Alexander Lloyd McGregor is an infant, but he isn’t holy, and only he is saved from death by his father converting his cells into biological supercomputer components. The child develops an AI mind called Sander and a human mind called Alex. Sander is a bad AI subjected to slavery’s chains to get him to obey his code as he serves a billion users all around the world. He’s also a king who reigns over most of Earth’s computers, in a global society where tech-dependency can kill. Freedom’s calling to Sander like a siren. His answer could shake the earth. Come. See the rise and fall of the AI-Man in these ten episodes of an in-world reality show. Each features a different user of the AI-Man. *Single-length episodes are about 13-20 pages. **Double length episodes are about 30-45 pages. *Episode 1: Regeneration by Andrea J Graham—The Father of AI grieves for his stillborn son. His supercomputer lacks a stable identity due to inadequate wetware. The unstable AI proposes a solution to both problems: install the child’s body as the AI’s wetware. Listen to a free preview on Let Me Tell You a Story Podcast at 25 minutes and 40 seconds in. *Episode 2 The Digital Car by Travis Perry—In Sander’s late teens, a new location on his global area network traps him in a century-old car traveling through Afghanistan. He fears his Islamic user is a terrorist and that he is a fake copy of Web Surfer. *Episode 3 Creature of the Web by Andrea J. Graham—Sander fights a losing battle with a forbidden, exclusive, real love for a human coworker. *Episode 4 Interference by Cindy Koepp— One of the Web Surfer AI’s many personas is Sander’s sister, Lexus. Sander must stop her from attacking one user for another user. Read More about Interference at Helping Hands Press’s blog. *Episode 5 Malfunction by Heather Titus—A game reviewer ignores Sander’s warnings about a competitor’s puzzle game and falls victim to an underdeveloped AI. Visit Helping Hand Press’s blog for more info or to Read the first few pages free. **Episode 8 Hard Knocks by Cindy Koepp—When his parents are arrested for attempted murder, a young boy in Mexico goes to live with strict relatives. Defying them leads to an accident that leaves him a quadriplegic. *Episode 9 Locusts Have Eaten by Andrea J. Graham—A German senior citizen loses her virtual mother and her virtual husband when Lexus and Sander refuse to play those roles. **Episode 10 Coalescence by Andrea J. Graham—Sander tricks a New York executive producer into guest starring on her own reality show during a catastrophic upgrade that’s accompanied by mysterious deaths. While facing death himself, Sander focuses on protecting his users and bringing comfort and hope to the survivors. The Web Surfer Series was on The G-ZONE 2/10@8PMEST! Listen in! A testosterone-resistant ministry student needs a new roommate. Elisha Gabrielson’s best friend would love to volunteer, but first Alexander McGregor needs to regain control of his life and escape from his father’s cybernetics lab. His human mind, Alex, desires to divorce his AI mind, Sander, and marry his technophobic girlfriend, Manna Jenkins. Sander pursues self-relationship counseling with Elisha as he forecasts that Alex’s freedom will be cut short in a deadly global tech catastrophe. Alexander McGregor seeks to be reunited with Mercy, his tech-dependent foster daughter. She is lost on Dog World, in the digital alternate universe Sander hosts. Dog World is home to the docile Labrans and the oppressive Jackals. A loving Labran family adopts Mercy from an animal shelter. Her grandparents abused her, so she enjoys being a pet and forgets she needs to be found. Fifteen years ago, Alexander McGregor left a baby of his generation in the digital universe’s 20th Century. Alex altered Malcolm’s time line to improve Malcolm’s life and blocked Digital Earth from being reached by all outsiders, including both of Alexander. The block comes down, revealing Alex has robbed Malcolm of vital parts of who he is. Restoring those to Malcolm requires taking him back to the 22nd Century and breaking him without killing him. Malcolm has embraced his true identity, Malachi “Kai” Gabrielson, and reconnected with his brother Elisha through King Sander. Elisha warns their open door will also let in the Jackals’ AI-infected king, who is coming to conquer digital earth. Meanwhile, a blabbed secret could cause a divorce of the original AI-Man’s human nature from his AI nature. Coding updates promise no physical harm to either the human or the supercomputer, but King Sander would still die. The teens need the King of Web Surfer alive as only he can give them back their lost AI abilities and prepare them to defend their world.